In Stage IV melanoma patients, a high percentage of Tregs appears to be associated with shorter survival. Received 12 February 2008 published online 03 June 2008. 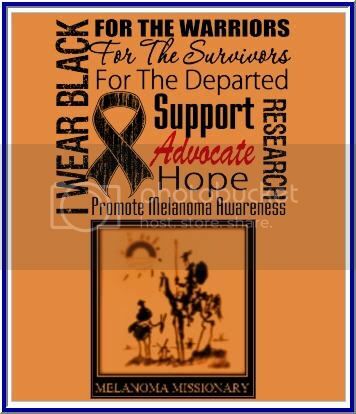 Melanoma often elicits a profound immune response, and this response has been exploited by various immune therapies. These immunotherapies ultimately fail, however, and advanced melanoma is uniformly fatal, suggesting the development of an immune escape mechanism. In this study, markers of immune escape including regulatory T cells (Tregs), dendritic cells (DCs), and TGF-β were evaluated in 14 Stage IV melanoma patients and correlated with survival. Stage IV melanoma patients had a doubling of regulatory T cells compared to both normal subjects and stage I melanoma patients. There was a significantly higher number of DCs in all melanoma patients compared to normal subjects. Stage I melanoma patients had a significantly higher number of pDCs than normal subjects, and all melanoma patients had a higher concentration of mDCs than controls. Serum IL-4 and IL-10 were not detectable but serum TGF-β levels were significantly higher in stage I and stage IV melanoma patients compared to normal controls. Advanced melanoma is associated with increased numbers of circulating dendritic cells and regulatory T cells. These data suggest that melanoma induces immunosuppressive DCs and regulatory T cells in the systemic circulation. San Antonio Cancer Institute, University of Texas Health Sciences Center, and Cancer Therapy & Research Center, San Antonio, Texas, USA. Address correspondence to: Tyler J. Curiel, San Antonio Cancer Institute, University of Texas Health Sciences Center, 7703 Floyd Curl Drive, San Antonio, Texas 78229-3900, USA. Phone: (210) 562-5286; Fax: (210) 562-5292; E-mail: curielt@uthscsa.edu. Tumors express antigens that should induce immune-mediated rejection, but spontaneous rejection of established tumors is rare. Recent work demonstrates that one reason for the lack of tumor rejection is that tumors actively defeat host immunity. This concept forces us to rethink current approaches to harnessing potent, specific host immunity to battle cancer, most of which are based on the paradigm that inducing more antitumor immune cells alone is therapeutic. However, as I discuss in this Personal Perspective, a newer paradigm predicts that reducing tumor-driven immune suppression will be clinically beneficial. CD4+CD25+ Tregs are one mechanism of tumor-driven immune evasion that provide prototypical targets for testing novel anticancer treatment strategies within the newer paradigm. 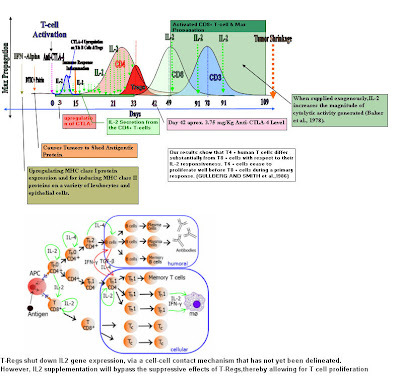 This paper is one of the better ones for understanding the whole Treg Thing. Ipilimumab and Interluekin-2 in combination will change the paradigm in novel anticancer treatment strategies as we see it today and may hold the key to durable remissions of melanoma. Commentary.. Is this What Melanoma Patients are going to foresee in the future with Ipilimumab from BMS? As one can see GREED has been taken to the next level. I am astounded that BMS will not Help, when their help is needed. Where are their ETHICS????? "California’s AIDS Drug Assistance Program (ADAP), like ADAPs across the nation, is in jeopardy as California’s budget continues to suffer the ravages of the recent recession. As available state general fund dollars continue to shrink, demand on the program has grown faster than normal (another byproduct of the recession) and the cost of drugs has been increasing. "This is an unsustainable situation. California has no interest in depriving people with HIV/AIDS of drugs that keep them alive, so the only available recourse is to rein in the growing drugs costs. On balance, it seems that all parties should do their part to ease the pain this recession has inflicted on ADAP." In order to help alleviate the crisis, other major AIDS drug manufacturers have agreed to significant reductions in the pricing of their lifesaving AIDS medications to ADAPs, including Merck and Company, Johnson & Johnson’s Tibotec Therapeutics, Gilead Sciences Inc., Viiv Healthcare and Abbott Labs. But not BMS. Meanwhile, twelve states have instituted waiting lists. And the number of people waiting to access medicines continues to balloon. In Florida, the waiting list is increasing at a rate of 250 to 300 people per month. Since it was first approved by the FDA in 2003, BMS has increased the price of Reyataz by over 25%. Today, the Average Wholesale Price (AWP) of Reyataz (atazanavir) stands at $13,046 per-year. AHF officials note Reyataz must be taken with at least two other HIV/AIDS drugs as part of an effective antiretroviral treatment regimen. AHF has seen firsthand the impact of high priced AIDS drug like Reyataz. In California, for example, since 2000 the number of new ADAP clients has only increased by 50%, but AIDS drug spending has increased by 165%. The price of Reyataz and other drugs is a major contributing factor to this increase. Across the country, states have been forced to make cuts to ADAP services and enrollment because of high cost AIDS drugs like Reyataz. States can no longer afford to provide treatment to many of their current ADAP clients, and as costs increase more people will be put at risk of losing access to services. Ultimately, this means that the more people who go on high-priced drugs like Reyataz, the fewer who can receive lifesaving services. AIDS Healthcare Foundation (AHF), the largest global AIDS organization, currently provides medical care and services to more than 139,000 individuals in 23 countries worldwide in the US, Africa, Latin America/Caribbean the Asia/Pacific region and Eastern Europe. As I see it, The Melanoma Patients could be next in line. We'll go next to Seamus Fernandez with Leerink Swann. Just a couple of questions on ipilimumab actually. Can you just discuss the kind of strategy that you might be evaluating relative to -- assuming that the frontline study is successful, the strategies in terms of pricing that you're thinking about relative to the differential in the 3-milligram per kilogram dosing versus the 10-milligram per kilogram dosing that you have for second-line versus first-line and how you can deal with that commercially? And then secondly, could you just, Elliott, clarify for us the maintenance paradigm in the IPI 024, the frontline study, versus the retreatment paradigm in the 020 study? I think there might be a little bit of confusion out there. I think it would help to clarify that. Than means I would start, and I will ask Beatrice to follow. Obviously, pricing of IPI is natural very important to us. We have initiated that review of the different options we have. And for obvious reasons, we will not disclose much in terms of prices until we are closer to the market. There is a -- this is really a different situation from what we experienced in the past with other oncology products because of the emerging profile of these products. So we don't want to exclude any possible new approaches to pricing, and we will discuss more about this when we launch. But Beatrice, why don't you speak a little bit more about the opportunity that we see for IPI? As you know, this is a working science and new, so we don't really have a comparator into most standard of care because many investigational agent are used in that segment. So it creates a new set of challenges for us on pricing, I think if you outline some of them with a three and a 10, you will find interesting and new approach to solve that. The number of case is 30,000 to 40,000 annually in the U.S. and EU, and 60,000 worldwide. And we also know from, and Elliott will comment more about the schedule and dilution, but we also know in the surrounding setting that most of the patient will be treated with a number of dose and that would be it. So it creates an interesting situation for pricing and we're, clearly, today working very hard on nonstop therapy pricing in our overall share to be determining the optimal pricing for the products and to satisfy the multiple stakeholders and the access around markets when we introduce it. So interesting challenges, not on insufferable secondhand setting with a definite, it's a definite market. As you know, some of our patients also know it's a semi-treatment in most patients. So those are along the line of what we are working on today. So with regard to the maintenance schedules or the terminology of induction, re-induction and maintenance, in 020, there was no maintenance per se. There was induction and based on physician evaluation, a possible re-induction. 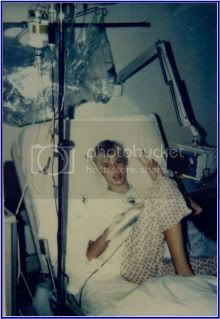 The induction is an infusion, in this case, the three milligram dose, every three weeks for four complete doses. Now if a patient did respond, and these are patients that are pre-treated for which there's no approved drug and it is a fatal disease. If they did show some benefit after that induction and then later, seem to deteriorate, they could be reinduced. The 024 was a different trial, there is an approved drug DTIC and we ran ipilimumab on top of that backbone. To see if we could improve against the standard care and first-line metastatic melanoma and the protocol for that was at 10 milligrams. It was the same four doses in the induction every three weeks, and then there was a maintenance every three months. The science is coming in loud and clear. Remember I said blame it on the Tregs!!!!! Well Here is some conformation of that. 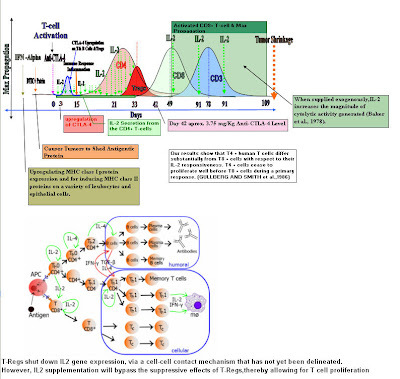 The antigen-specific reaction of T-cells working with dendritic cells, which regulate the immune system. SYDNEY: The manipulation of specific immune cells in bone marrow transplants has left a number of patients cancer-free, giving new hope to leukemia and lymphoma sufferers, according to a recent study. A team lead by Sébastien Maury from the Service d'Hématologie Clinique, France, has shown for the first time that by depleting the regulatory T-cell (or Treg) population in donor tissue, patients suffering from very resistant forms of cancer can achieve complete remission. By identifying the Tregs’ influence on how a new immune system reacts to foreign elements, it’s hoped that this study will result in more successful cancer treatments using transplantation. Bristol-Myers Squibb could be in a position to launch ipilimumab for the treatment of second-line metastatic melanoma early next year if the recently submitted drug is granted a priority review by regulators. The company announced during a second quarter earnings call July 22 that it submitted regulatory filings for ipilimumab with both the U.S. FDA and European Medicines Agency at the end of June. Approval of the cytotoxic T lymphocyte antigen-4 inhibitor seems likely based on a Phase III trial showing it offered a survival benefit to metastatic melanoma patients, though not without some immune-related adverse events. The data's June release at the American Society of Clinical Oncology attracted headlines since ipilimumab is the first drug to demonstrate a survival benefit in this patient population, which currently has few treatment options. Bristol also said it plans to initiate a Phase III trial studying ipilimumab in patients with non-small cell lung cancer later this year based on positive Phase II results. The drug is also in Phase III trials for adjuvant metastatic melanoma and prostate cancer. Like other oncology drug manufacturers, Bristol will need to wrestle with pricing strategy for a drug that might eventually be used across multiple indications. The company will have to take future potential indications account when setting the initial price for ipilimumab in metastatic melanoma. The potential NSCLC indication, for example, could turn out to be more costly based on its more frequent dosing schedule. Ipilimumab was dosed in the Phase II NSCLC study at 10 mg/kg every three weeks for initiation and then 10 mg/kg every three months in a maintenance schedule. In the metastatic melanoma study, ipilimumab was dosed at 3 mg/kg every three weeks for four doses with no maintenance dosing. Management declined to comment on ipilimumab pricing but did note that the issue is a challenging one, especially because there is no existing comparator in the market for metastatic melanoma. "This is a really different situation from what we experienced in the past with our other oncology products because of the emerging profile," CEO Lamberto Andreotti said. "We don't want to exclude any possible new approaches to pricing." The ipilimumab filing serves as a one-year anniversary present for Bristol's acquisition of Medarex. The acquisition, announced July 22, 2009, evolved from a multi-year collaboration by the two firms centered on ipilimumab development. 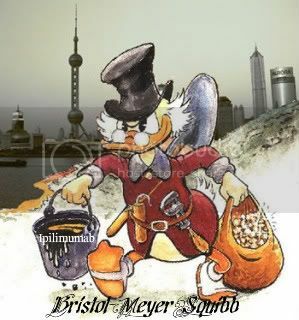 Bristol also reported second quarter sales of $4.8 billion, up 2 percent compared to the year ago period, including a 1.5 percent negative impact from U.S. health care reform. Net income was $927 million, down 6 percent versus $983 million a year ago, reflecting the spin-off of its Mead-Johnson Nutritionals business. That spin-out, announced last November improved earnings-per-share however by reducing the number of Bristol's shares outstanding. Now, we will be able to use this Drug to save Melanoma Patients. We need to push our oncologists for combinatorial therapy. It is all in the science!!!! Malignant melanoma is well known for its aggressive clinical behavior, propensity for lethal metastasis and therapeutic resistance. However, in the last decade, considerable excitement has been generated by the identification of genetic mutations in various components of signaling pathways involving melanoma initiation and progression, particularly those involved in the MAP and PI3 pathways. Most recently, clinical trials of pharmacological targeting of relevant molecular targets have demonstrated dramatic response even in patients with late-stage melanoma. The emerging insights into the mechanisms of activation and negative regulation of innate and adaptive immunity to tumors have provided another breakthrough in melanoma therapy. A new family of immune-based agents of monoclonal antibodies that exert their functions by tampering with immune system cell molecules causing an enhancement of antitumor immune responses has entered clinical trials. In general, these new antitumor agents are designed to break down the barriers to tumor tolerance/immunity. This new group of agents holds promise for at least additive effects with conventional therapies, as well as signal transduction pathway targeted therapies. Several key genetic lesions governing melanoma initiation and progression have been identified, the earliest and most common being a point mutation (T1799A) in the BRAF proto-oncogene, which is detected in approximately 60% of metastatic melanoma. BRAFT1799A encodes BRAFV600E, a constitutively active protein serine kinase that elicits sustained activation of the BRAF® MEK1/2® ERK1/2 MAP kinase pathway. The prevalence of RAS/RAF alterations in human cancer has prompted significant efforts in the development of drugs targeting the MAP kinase pathway. Many of these are currently in clinical trials in patients with metastatic melanoma. Studies with the broad spectrum RAF inhibitor sorafenib (Nexavar, Bayer) as a single agent in patients with BRAF mutated melanoma have proved disappointing. What was unclear from these studies was whether the lack of efficacy was because BRAF was not a critical target or because of incomplete blocking of BRAF by sorafenib. Since 2005, several BRAF inhibitors have entered clinical trials. These inhibitors are grouped in two categories: BRAF selective inhibitors, and broad spectrum multiple kinases inhibitors with high potency against BRAF. PLX4032 (Plexxikon, also known as RO5185426) is a selective BRAF inhibitor and is the first of its kind tested in advanced melanoma. A response rate of 70% in 32 BRAF mutated melanoma patients was reported in the phase 2 study. In general, PLX4032 is well tolerated and most common toxicities include mild-to-moderate skin rash, sun sensitivity, fatigue, arthralgia and keratoacanthoma. Currently, there are two ongoing PLX4032 trials. The first is a phase 2 study of PLX4032 as a single agent in BRAF mutated melanoma patients who have failed standard therapy for metastatic disease. This study will hopefully confirm the high response rates observed in previous phase 1/2 studies. The second is a phase 3 trial comparing PLX4032 with dacarbazine (standard chemotherapy) in chemotherapy-naive patients with BRAF mutated metastatic melanoma. Seven hundred patients will be enrolled; the primary endpoint is OS. Another BRAF selective inhibitor is GSK2118436 (GlaxoSmithKline). This drug has already shown promising antitumor activity in the phase 1 portion of a study. The phase 2 portion is ongoing. The impressive high level of antitumor activity of BRAF selective inhibitors indicates that both PLX4032 and GSK2118436 have single-agent activity; BRAF is an important target in melanoma. Currently, there are at least two nonselective BRAF inhibitors. XL281 (Bristol-Myers Squibb) and RAF265 (Novartis) are in phase 1 testing. Results are expected in the near future. MEK is a kinase and is immediately downstream of BRAF. It is never mutated in cancer but is activated by BRAF and, in turn, activates the rest of the MAP kinase pathway. In the laboratory, MEK inhibitors have shown activity in a number of BRAF mutated cancers. Currently, there are many MEK inhibitors in clinical trials. AZD6244 (AstraZeneca) is a MEK inhibitor that has been evaluated most extensively in melanoma. A phase 2 study comparing AZD6244 with temozolomide (oral chemotherapy) has found an objective response rate of 12% among 45 BRAF-mutated patients. However, patients in this study who received temozolomide had a similar response rate and PFS. Melanomas from acral lentiginous, mucosal and chronic sun-damaged sites frequently harbor activating mutations and/or increased copy number in the KIT tyrosine kinase receptor gene, which are very rare in more common cutaneous melanomas. Multiple case reports and early observations from clinical trials suggested that targeting mutant KIT with small molecule KIT inhibitors such as imatinib (Gleevec, Novartis) and/or dasatinib (Sprycel, BristolMyersSquibb) is efficacious. Although the dramatic clinical activity of BRAF selective inhibitors is a major breakthrough in the treatment of this disease, there are many hurdles to overcome to optimize this targeted therapy approach. Many of the patients who initially responded to PLX4032 have subsequently progressed with a median duration of response of approximately 8 months. The mechanisms that cause resistance are largely unknown. Recently, a number of preclinical studies have demonstrated that BRAF inhibitors activate MEK and MAP kinases in melanoma cell lines with wild-type BRAF, including cell lines with mutant NRAS. These studies suggest at least one potential mechanism of resistance is through continued activation of the RAS-RAF-MEK-ERK signaling pathway. Thus, combination agents that target multiple components of this pathway have great potential to overcome drug resistance. Several ongoing clinical trials using the combination of BRAF and MEK targeted agents will be able to test this hypothesis. Since the discovery of monoclonal antibodies in the late 1970s, it has become clear that these antibodies, which are of defined specificity and can be produced in large amounts, had potential for the management of various diseases, including malignancies. The key property of antibodies to be used as therapeutic tools is their behavior as high-avidity ligands to protein or glycoprotein. Most recently, a new group of monoclonal antibodies that enhance the cellular immune response against cancer have entered clinical trials. These agents bind molecules on the surface of immune system cells. They either provide activating signals to lymphocytes and antigen presenting cells or block the action of receptors that normally down-regulate the immune response. A humanized monoclonal antibodies (MDX-010, Medarex) against cytotoxic T-lymphocyte antigen 4 (CTLA-4) is the first to reach clinical trials. 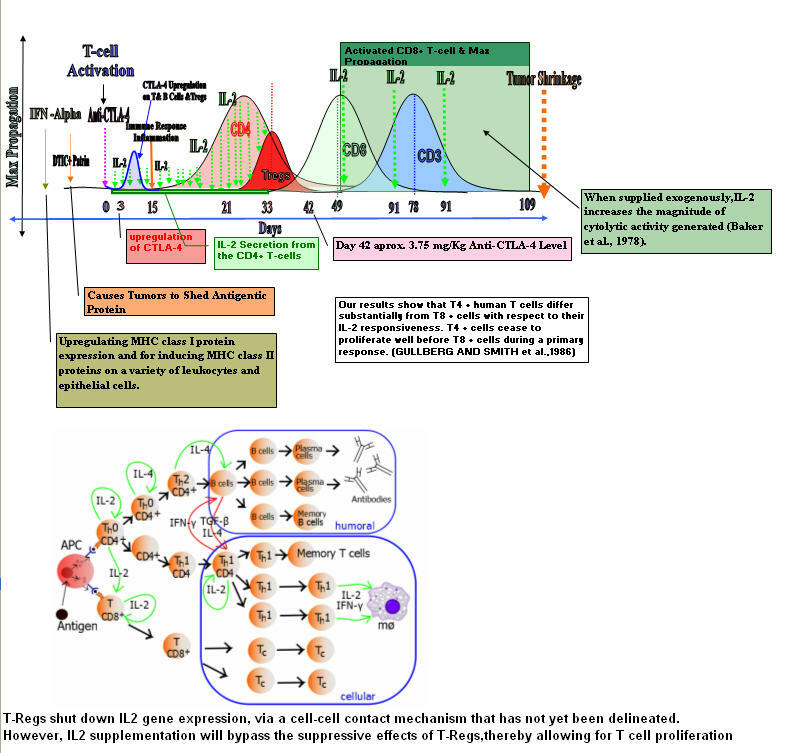 CTLA-4 is only expressed on the cell surface of activated T cells and regulatory CD4+ CD25+ T cells. In murine models, systemic treatment with transplantable immunogenic colon carcinoma cells with anti-CTLA-4 monoclonal antibodies induced complete tumor regression of established tumors through an immune response found to be critically dependent on the activity of cytotoxic T lymphocytes. Various phase clinical studies have been conducted on the two anti-CTLA-4 monoclonal antibodies, ipilimumab (Bristol-Myers Squibb) and tremilimumab (Pfizer), as monotherpy, in combination with vaccines or other immunotherapies, and in combination with chemotherapies. Blockade by the T-cell inhibitory molecule CTLA-4 results in antitumor response with overall response rates from 10% to 20%. Most adverse events involve autoimmune toxicities, such as dermatitis, uveitis, colitis/enterocolitis, hepatitis and hypophysitis. 4-1BB (CD137) is a surface glycoprotein that belongs to the TNF receptor family. 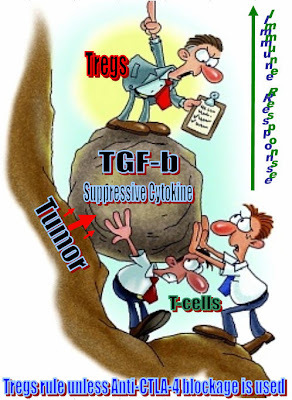 It is expressed by activated, but not resting, T and NK cells. A humanized anti-4-1BB monoclonal antibody (Bristol-Myers Squibb) has been tested in clinical trials. However, the phase 2 study in refractory melanoma was discontinued in May 2009 due to unusually high incidence of grade-4 hepatitis. 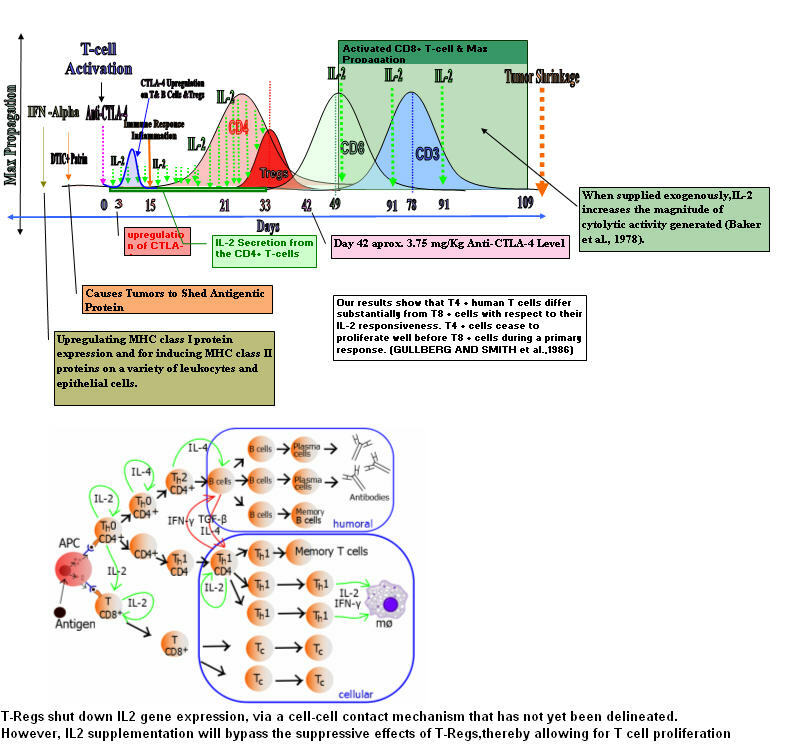 Programmed death 1 (PD-1) and its ligands, PD-L1 and PD-L2, deliver inhibitory signals that regulate the balance between T cell activation, tolerance and immunopathology. In vivo studies have shown B7-1 (CD80) is also a binding partner for PD-L1, and their interactions can lead to bidirectional inhibitory response in T cells. PD-L1 is expressed on many tumors including melanoma and is a component of the immune suppression by the tumor microenvironment. Phase 1/2 experience of the anti-PD-1 monoclonal antibody, MDX-1106 (Medarex, Ono-4538), in refractory or relapsed malignancies was presented at the 2009 ASCO Annual Meeting. Clinical activity against melanoma was observed and, more importantly, no MDX-1106 related severe adverse events were noted. In 2009, at M.D. Anderson Cancer Center, we participated in a phase 1 study of anti-PD-L1 monoclonal antibody (MDX-1105, Medarex) in refractory metastatic melanoma. MDX-1105 has been tolerated by all patients. Most adverse events were mild and were related to inflammatory responses in the tumors, not immune-related toxicity. Clinical responses were observed at all dose levels (1 mg/kg to 10 mg/kg every 2 weeks). Durable partial responses and stable disease were noted in patients whose disease had progressed after at least one, and as many as five, prior systemic therapies. Based on the low toxicity and impressive clinical activity, a phase 2 study of MDX-1105 in advanced melanoma is warranted. In summary, the treatment of metastatic melanoma is changing rapidly due to the great success in translational research from bench to bedside. Although such studies, to date, have focused on the treatment of advanced metastatic disease, the approaches of targeting signal transduction pathway, as well as targeting tumor immunity barrier, hold great promise to the development of preventive strategies and personalized therapies in malignant melanoma. Wen-Jen Hwu, MD, PhD, is a professor in the department of melanoma medical oncology at The University of Texas M.D. Anderson Cancer Center and is a member of the HemOnc Today Editorial Board.